When I first ordered my Arduino Experimentation Kit from those nice people at oomlout I also ordered a 16 character by 2 line LCD display. It was really easy to set up and use thanks to the instructions that came with it and the LiquidCrystal library bundled with the Arduino software. 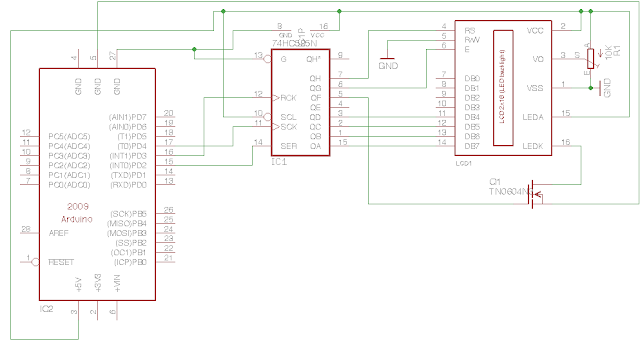 The only problem is that it takes up a lot of valuable output pins, 6 in 4bit mode and 10 in 8bit mode, this makes it difficult to use in large projects, as you can quickly run out of pins. This circuit will allow us to control the output of the display, as well as the LED backlight. The backlight is controlled by an N-Channel MOSFT connected to pin QF on the shift register. We are using a MOSFET because the input impedance of the MOSFET is very very high which makes it ideal for using in logic circuits. To meet the third goal I decided to modify the LiquidCrystal library. The reason being that the wonderful people who wrote it in the first place already did all the hard work of programming the methods for initialising the display and outputting data so it would be a bit daft to re-write all of that when all that is really needed is to change the way that the LiquidCrystal library sends data to the display. After a couple of hours I had successfully rewritten the 'send', 'write8bits' and 'write4bits' methods and began testing. The image above looks very complicated, but that is because those two bread boards contain both the 8bit and 4 bit versions (the screen is plugged into the 8bit interface). In conclusion: the shift register interface is very simple to build and not too hard to program and makes the LCD screen easier to use in your projects. Hey Chris, nice work. I was just asking this question on an arduino forum (adafruit.com) and sure enough i came across your post. Great work. Given the principle it should be easy enough to scale that up to more LCD's if you daisy chain more 595 shift registers right? I was looking to implement 4 16x1's but wanted a way to conserve pin outs by utilizing a shift register. I think you've pointed me in the right direction. I am N.Nandhakumar, from India. I am a Final Year student doing project on Arduino.I was searching a lot to interface JHD162a 16*2 display with GPS [shielded] and Arduino with less than 5 pins. I found your post and it was really useful. I built the schematic you have told, but the LCD dint respond.I get only black blocks in the first line of the LCD.I am using a 74HC595 and built it on a BreadBoard. The list of Components used for the circuit. Few more details of MOSFET. Very nice project! Is it possible to add 3 more shift registers? Right now im contolling 3, 7segment displays with 3 595`s. The 595lcd has to go in front of them. chris, i took a look at your code and it looks great! did you happen to make anymore attempts at the 74ls164n? i've been tinkering with it for a bit, but its looks the two ICs are a little different... any plans for a 2 wire version? im off to dig for 595's! cheers! I liked and appreciated very much your shift lcd library and the way you created the Shift LCD. Actually I'm using ths as part od a complete motor step controller based on Arduino with several enhancements. Please, contact me as soon as possible, thank you. Its brilliant, thanks! I've also combined it with some AND gates so I use 2 pins to select which device is being controlled by the shift register, and then 3 pins for shift registers. I now have a total of 5 digital pins used for 4 different types of display (2xlcd, 2x7seg display). What's best about it is that once I had rewired the board, changed the library it was importing, and used the shiftlcd initialisation, I didn't need to change anything else. I too had a number of HC595 available. So I downloaded your library to tried it our. As others have already said, Brilliant. I have a number of SPI controlled items in a project, and I am wondering it this library can be converted to use SCK and MOSI and a unique Strobe pin? Very useful in theory, though I can't get it to work. I just get black bars on the first row and that's it. Checked all connections twice too. The lcds I'm using work just fine with the normal library, am I missing something? Scratch that, I had a 1uf capacitor in the circuit, and removing it fixed it. Could you help me how to change the delayMicroseconds(); to some no delay() stops because I have a 8x8 LED matrix which starts flickering when I write to the LCD. I need the speed because there is a non flickering animation in the background. The rows of the matrix are turned on when a variable reaches a value from 0 to 7. Thanks, your solution works almost perfectly. I just saw an interesting behavior, not sure if this is an issue with your library or is native arduino library doing the same thing (haven't tested yet). When you do lcd.print("1234567890a234567890b234567890c234567890d234567890") with a 16x2 screen, on the second line only the string from letter "d" appears. Any Ideas what might be wrong? Just installed the library and tested it with an auto-range ohm meter I am busy with at the moment. And it works like a charm. Thanks a lot. Saves me some pins for further expansion. I seem to have a problem writing to the LCD after using backlightOn() and backlightOff(). After the first call to backlightOn() I get garbled characters. But I have recently bought the new chipkit uno32 ("100% compatible" they said...) and ShiftLCD doesn't work with it! Do you know how to transfer the library on the uno32? Congrats on what i can see to be excellent code. right at the start of the code..
* transmitter and have a receiver decode it into servo movements. * to program in mixers, as well as adjust servo centers, end points and throws. timer 1, a 16bit up/down timer. been over and over the code but cannot find a logical reason for it. Have you encountered this before and if so...what was the cause? Would love to have a play with your code, bt cant get any further. Sorry to bother you, any chance you could give 30secs to advise on this? I was wondering if anyone knew how to make this library work in 1.0? Here is the error that I am getting. To everyone looking for this, can I recommend the more standard LCD3Wires setup and the arduino 1.0 compatible code I wrote do give full LiquidCrystal functionality? I get an error when compiling the sketch with the Arduino IDE 1.0. The error happens on all my computers. Here's how to make the code compatible with Aruduino 1.0. Change line 6 to #include "Arduino.h"
I also encountered the backlight problem, and I came up with an ugly solution. I have no idea why it solves the issue but I realized that in my code I needed to turn ON the backlight twice before I can input any more text in properly. Same for off, I needed to call the Off twice, reseting the cursor each time and then text will display properly. Hopefully some can shed some light on this issue and come up with a more elegant fix. Thanks! It works, but "size_t ShiftLCD::write(uint8_t value)" is on line 252 instead of 256! Thanks for the information and well laid out documentation. I am currently attempting to interface a 4x20 LCD to an Atmega 328P. Will I require more than one 74HC595? Thanx for ur post nd ur article, today I just tell u about a biggest retailar in electronics, ya Sargam Electronics is the biggest Retail Chain in Electronics in Delhi. Sargam deals with big brands like Samsung, Sony, Lg, Toshiba, Sansui, Hitachi, Voltas, Godrej, Azure, Nikon, Whirlpool, Dell, HP, Acer and many more brands. Sargam Electronics offers you to buy many electronics products like laptop,mobile,camera,washing machine,refrigerator,air conditionar and multiple electronics products at huge discount. I could not make this work, even after some adjusts pointed by @Ckwong. Probably I miss something, because the lcd was showing some chars randomly. But it makes me understand how it should work. Thank you Chris Parish. At the end I got this: http://playground.arduino.cc/Main/LiquidCrystal. It works with my arduino uno 1.0 and. This is a good alternative. Thanks! It works, but "size_t ShiftLCD::write(uint8_t value)"
Hello, Does this work with Arduino2560? what are the changes to make? All credit to Chris Parish, all I did was add a few lines. @Darshan, the library looks like its fine for a Mega2560, with no changes at all. Very effective ! Thanks for this awesome work. I wonder how i could use 2 LCD with this library ? Any idea someone ? That's actually a really cool application. I didn't think it would be possible (or practical) to control an LCD with a shift register. That being said, how easy would it be to reapply something like in this arduino lcd tutorial? I can't get the "Hello world" to be printed. I just see the "H" in the first column and then nothing after . lcd.print ("Hello world") // prints "h"
all LCD displays that are compatible with the Hitachi HD44780 driver.